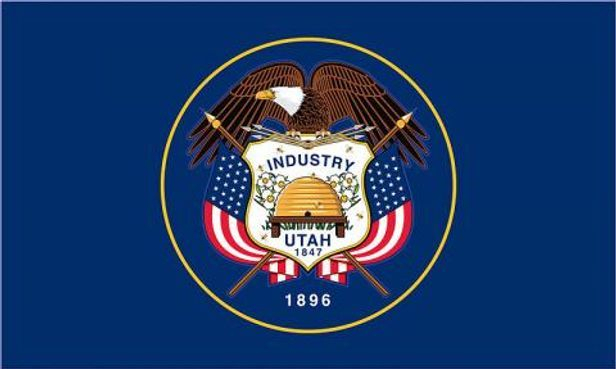 Utah became the 45th state of the United States of America in 1896. Its nickname is the Beehive State, which is referenced by its state highway shield. Associated with Mormon pioneers Joseph Smith and Brigham Young, Utah's landscape is dominated by desert and a number of ranges of the Rocky Mountains. Most of Utah's residents live in the Wasatch Front corridor made up by state capital Salt Lake City, home of the Mormon Temple, as well as Ogden and Provo, both of which are metropolitan areas in their own right. Utah contains several national parks including the Arches, Zion and Bryce Canyon. Skiing and hiking trails line much of the state as well. Utah is one of the Four Corners states, the other three being Colorado, Arizona and New Mexico. Utah's prominent north-south highway is Interstate 15, which emerges from Arizona's northwest corner, passes the areas of St. George and Cedar City, as well as a couple of the national parks, and heads up through Salt Lake and the rest of the Wasatch Front, before moving into Idaho. Interstate 70 has its west end at I-15 in Cove Fort in Millard County, and passes by the Arches and Green River on its way into Colorado. Interstate 80 runs east-west through the Bonneville Salt Flats, below the Great Salt Lake, through the state capital, and up into Wyoming. Interstate 84 comes out of Idaho, overlaps with I-15 from Tremonton to Ogden, and ends at I-80 somewhere outside of Park City. Mostly surrounding Salt Lake is the three-quarter Interstate 215 Belt Route, which has interchanges with I-15 and I-80, and passes to the east of the Salt Lake City airport.